Three seats left in my Advanced Memoir workshop this January! :) | Amanda Morris, Ph.D. Fellow writers! You might have seen previous posts about this workshop and now it’s crunch time. I need a few more participants to fill the workshop – three seats. I suspect that at least three of you are working on a creative nonfiction project that would benefit from this intensive workshop weekend. If you are working on a memoir-in-progress (at ANY stage! Even if you just have a few chapters – or some islands!) and want some feedback as well as some inspiration, please consider joining me for an Advanced Memoir Workshop this January in New Jersey. I know, the Jersey Shore in JANUARY?! Yes. The Stockton Seaview Inn is beautiful, spacious, and warm with terrific service and good food. When I taught at this workshop weekend last year, I was so impressed with the congeniality of fellow staff and all of the writer-participants. 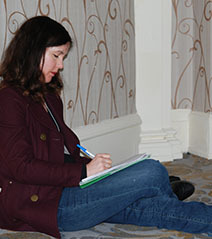 Everyone was fully engaged in the writing process and brought a high level of enthusiasm and insight to every session. If you want to be around like-minded writers and focus 100% on your memoir-in-progress (no matter where you are in that process), join us in New Jersey in January! It may be just the jolt you need to keep going. So don’t buy a new TV today – buy yourself a productive writing weekend! 🙂 Hope to see you there! Using Vivian Gornick’s famous line about “what matters,” we’ll investigate the best way to tell your story in this advanced memoir workshop. With your own memoir-in-progress as a springboard, you will explore the importance of seeing your first-person narrator as a character in your story, experiment with writing exercises and discuss your new work. Be ready to submit 2-3 pages on which you need feedback by Dec. 15 (or if registering after that date, submit within a week of registering). The workshop leader and participants will read each submission before the Getaway.